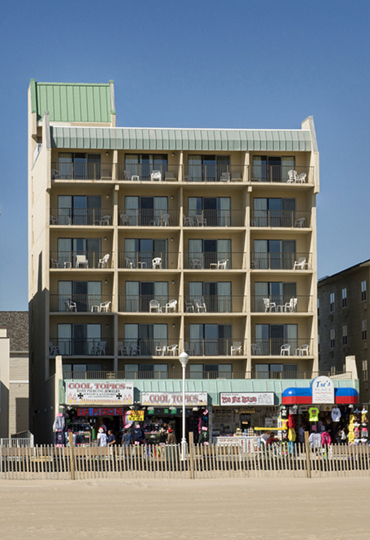 Boardwalk One is steps away from the Atlantic Ocean and has an outdoor pool that is open seasonally. 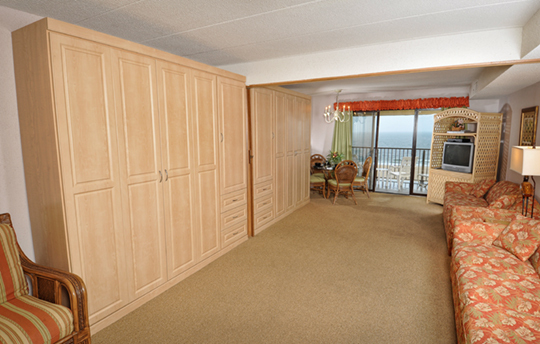 All units sleep up to four people and have private balconies with either an ocean view or pool view and two queen-sized murphy beds in the living room. There is also a kitchenette in each unit. There are on-site laundry services and complimentary on-site parking for all guests. From June through August, many local places offer special opportunities such as the beach at 27th Street offering Beach Olympics and every Monday thru Saturday, you can learn about sharks and watch feedings at the Ocean City Life Saving Station Museum. For families looking for a little extra activity, pedal down to Bike World, which offers weekly rentals or head to Holly Ridge Equestrian Center and saddle up. You can also enter the world of virtual activity at Marty's Playland. Center for the Arts and history buffs will want to visit Julia A. Purnell Museum with variety of exhibits on display. Water activities are everywhere in Ocean City. Rent wave runners or go parasailing. Or check out the largest surf shop in Maryland, K-Coast Surf Shop. Visit a winery or a brewery, or if gambling is something you enjoy, be sure to check out The Casino at Ocean Downs. Ocean City, Maryland invites you to experience the best of the Atlantic shore and Boardwalk One is the perfect place to stay.